One of the most prestigious and longest running Ford events in the country, the Ford Motorsport Nationals takes place at the scenic and historic Maple Grove Raceway in Mohnton, PA over the weekend of June 27-30, 2019. The 2,000hp VP Racing Fuels Street Outlaw category will rule the strip with impressive 275 radial cars. NMRA will pack the property with 6 heads-up classes, 5 Index categories, Bracket Racing, Car Show, and a huge Manufacturer's Midway. 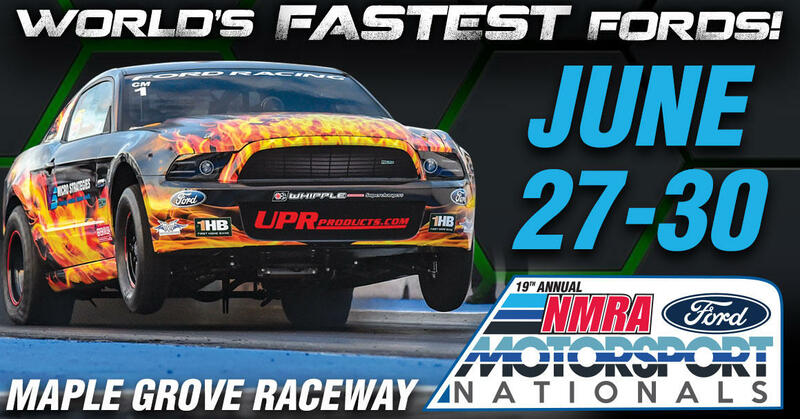 All the cars and all the stars of NMRA Ford drag racing will return once again to famed Maple Grove Raceway for the ultimate Blue Oval slugfest! Last years event was huge, and this years NMRA event promises to be even bigger as word spread around the Ford drag racing world that Maple Groves facility is among the best in the U.S. and the racing surface is perfect for setting national records. This is a must attend event for any Ford fanatic wanting to see the best in NMRA and Ford motorsports! This event will also bring out each of the NMRAs premier heads-up classes the epitome of Ford drag racing. Many of the NMRAs regulars live within close proximity to Maple Grove Raceway and use it for testing, so they may have a leg up on the competition due to their familiarity with the facility but dont let that fool you! Each racer coming from afar will be looking to take their shot for all the glory on the strip in their respective classes and take down those local starsits sure to be a classic. If youre a fan of the Street Outlaws TV show then you wont want to miss the insane, horsepower-infused Street Outlaws of NMRA Ford drag racing! Watch as these incredible turbocharged, supercharged, and nitrous packed Mustangs go wheels-up and heads-up for big money and national bragging rights. Every NMRA events feature the wild Street Outlaws, Renegades, small-tire street cars, and special insane race classes. rom the entry-level True Street class all the way up to the aforementioned Street Outlaw class if youve got a Ford-powered, Ford-bodied car, theres a class for you to fit in. The True Street class draws the largest participation, with vehicles ranging from the fifteen-second zone all the way down to eight-second heavy hitters. Winning any NMRA class isnt easy and when a racer is fortunate enough to do so, it needs to be celebrated in style. The NMRA has partnered with Aerospace Components to present the Aerospace Components Winners Circle making the accomplishment of winning even more of a celebration. The Aerospace Components Winners Circle experience is second to none in the drag racing world, where every winner actually owns the winners circle for a period of time. Love bracket racing? If so, be sure to enter your Mustang or Ford in 1 of 4 bracket classes: Fast Ford, Quick Ford, Street Ford, or Nostalgia Ford. In addition to all of the action that will take place on the quarter-mile, the NMRA also has the awesome UPR Products All-Ford Car Show, which features over fifty different awards that are presented each day of the show. 32 Ford with a late-model 5.0? Or a 2003 Cobra stuffed full of aftermarket parts? No matter what your Ford flavor, theres a place for you in the car show and a shot at the grand prize. This NMRA event will feature an awesome manufacturers midway where you can find great deals on the performance parts you need for your Mustang or Ford.Theres something for everyone at the NMRA Ford Motorsports Nationals make your plans to attend now!